High performance industrial dispensing guns for handling adhesives, epoxies, silicones, RTVs, grease, paste, gels and many other assembly fluids. Dispensing systems for fluids in industrial cartridges. Safe for use to 100 psi air pressures. 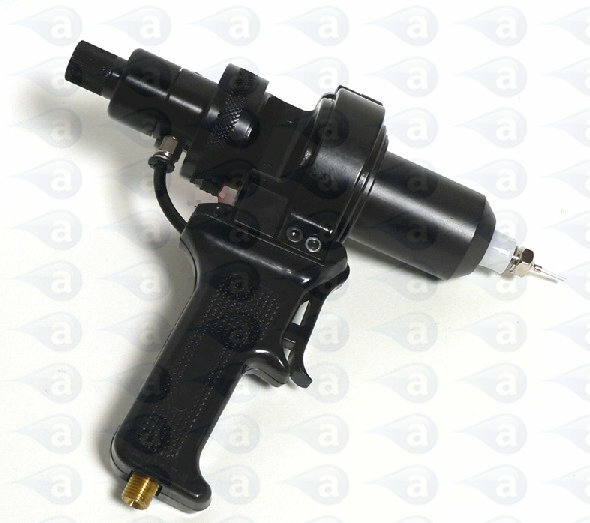 Hand Our guns are high quality applicators used in many industries. They are designed for the quiet, pneumatic application of sealants, RTVs, silicones, adhesives, potting compounds, and other materials in disposable cartridges or Techkit, Semkit cartridges for multi-component materials. The guns are available with retainers to fit standard 2.5, 6, 8, 12, 20 and 32 ounce disposable cartridges. Air hoses to operate the gun can be ordered separately. Guns are constructed of durable metal and engineered plastic parts designed to withstand the rigors of the production work place. The metal retainers are affixed to the valve assembly via a quick connect, secure bayonet lock fixture, permitting easy replacement of cartridges. For use in confined locations, the handle can be easily removed to allow more clearance and better manipulation. Cartridges allow use of standard nozzles with our standard 1/4" NPT thread attachment. Guns are safe and hygienic, reducing risk of operator contact with the materials being dispensed. They fit comfortably in the hand for use over long periods of time which minimises the risk of repetitive strain injury. Needle tip adapters can also be used with the cartridges for use of standard needle tips. Guns are covered by a 12 month warranty.